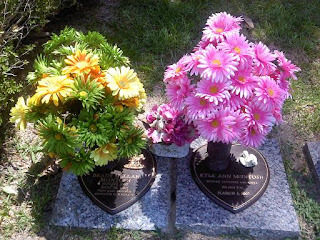 It's not that I have ever forgotten my children who are being raised by Jesus, it's that visiting the cemetery is painful and even though it has gotten easier to go, it's still hard. I'm a wimp. So, thank you to whomever you are that has visited in my stead. I arrived yesterday ashamed to see the flowers I had put a year ago worn out and faded with time. Ashamed that I hadn't been back to take care of the dirt and grass growing in between the stones. Ashamed that dead grass was covering up parts of the stones. But how honored I was to see that someone had put an angel figurine on Kyle Ann's marker (we didn't get the option to put a desig/figure on her marker but did with Brady...Brady's has two angels attached in honor of both of the boys.). And someone had put a planter of flowers between them both. Thank you for remembering my children. I promise I haven't forgotten them. Even though visiting there it looked like I had.